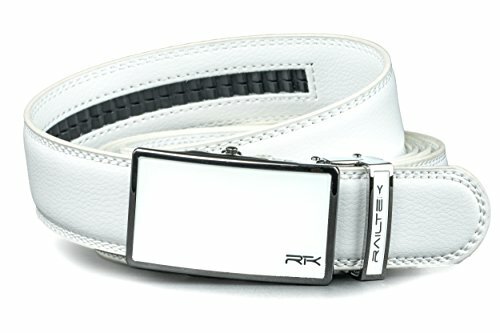 ➤ Railtek Belts are a high quality fashionable belt that will change how you look at belts. Our ratchet belts with no holes are fine-tuned and custom designed to make you stand out from the crowd. Each belt is customizable to fit your waist up to 50". Just cut, clamp, & slide the belt. Easy as that. ➣ High Quality Belts : We create the best possible product at a price everyone can afford. We use genuine leather & durable long lasting buckles to make your belt last. No more buying a new belt every 6 months. Long live your new belt. ➣ Design: Railtek Belts strives to produce fashionable leather belts that automatically fit no matter how your body feels that day. Our buckles are a perfect addition to any attire. ➣ No Holes, Perfect Fit, Every time: No more holes. No more awkward adjustments. Railtek provides automatic adjusting belts with just a quick slide. That's how it gets the name Ratchet Belt or Belt with no holes. This is because of the rail system embedded on the back side of the belt which interacts with the buckle to incrementally tighten or loosen your belt 1/4 of an inch at a time. No more dealing with the huge 1" gap between traditional belt holes! Best fit since sweat pants. ✅ Money Back Guarantee: Railtek Belts offers top notch service. Buy with confidence. NOT Satisfied, Let us know, we'll make it right! Your satisfaction is 100% our focus. We guarantee our product for the life of the belt. We know we provide a top notch belt, now you can too. ✅ FREE Gift Box & Microfiber Cleaning Cloth Each belt comes in an elegant Gift Box along with an exclusive microfiber cleaning cloth to keep your buckle looking sharp. ✅ With a 1 Year Guarantee, You Have Nothing To Lose; So Scroll Up To The Top, Click "Add to Cart" and Get Your New Ratchet Belt To Your Door In 2 Days! ✔ ONE SIZE, UP TO 50" WAIST - Each leather belt can be custom fit to your waist size by detaching the buckle, cutting off the excess belt strap with basic scissors, and reclamping the automatic buckle back on for a tailored fit. Fits ANY waist from 18" all the way to a 50" waist... Seriously any waist size up to 50"! ✔ GENUINE LEATHER & STURDY BUCKLE - Quality leather belts made of genuine leather and a sturdy durable automatic buckle. Stay looking dapper while allowing for 1/4 inch adjustments. Great for your new golf belt, wedding, or everyday mens belt. We are style-conscious and strive to provide a design that is clean and professional with a touch of modern class. ✔ TRIM TO FIT, NO HOLES, RATCHET SYSTEM - No Holes and a Perfect Fit. No more notches, holes, or bends in your belt that show where you have worn it for so long. This belt will change how you Look at belts. Just Cut to size, slide belt through the belt buckle, click belt into place, and you are set. PERFECT FIT EVERY TIME! Our mission is to provide the best quality adjustable belt at an affordable price. ✔ DIMENSIONS: BELT: 1-3/8 in. (3.5cm/35 mm) wide; BUCKLE: 1-9/16 in. (4 cm/40 mm) wide - All belts Fit ANY waist from 18" to a 50"waist. ✔ 1 YEAR GUARANTEE & FREE MICROFIBER CLEANING CLOTH - Long live your belt... PLUS a FREE Microfiber Cloth to keep it looking clean! If you are ever unsatisfied with the quality or performance of your belt, contact us and we will make it right! Your satisfaction is our #1 goal and we are confident you will love your Railtek Belt. Our belts are Quality Leather Belts meant to last. 100% Satisfaction Guarantee!! If you have any questions about this product by Railtek Belts, contact us by completing and submitting the form below. If you are looking for a specif part number, please include it with your message.